By Steve Annear -- Local and state officials are trying to decide what to do with the massive bridge passing over portions of Somerville that connects to Cambridge and leads into Boston. Calling the McCarthy Overpass “a monument to urban blight,” Somerville Mayor Joe Curtatone said the elevated roadway should be taken down to help integrate the neighborhoods that surround it. 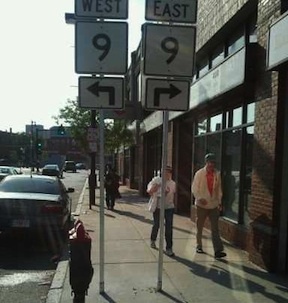 By Chris Helms -- Mayor Thomas Menino came out publicly against the "at-grade" plan for reconfiguration of the Casey Overpass area. He would have preferred a smaller bridge with a greenway beneath it. Mayor Menino isn't happy with the state's plan to tear down the Casey Overpass and replace it with a network of ground-level streets. By Marc Levy -- Even with four motions tabled, Monday’s meeting of the Cambridge Redevelopment Authority lasted three and a half hours [as it] began addressing construction proposed to benefit Google by developer Boston Properties. The building, which would link Google offices on opposite sides of a parking garage but take away much of a rooftop garden used by the public, is among the most significant and controversial issues facing Kendall Square. By David Abel -- "No trespassing" signs along a historic ribbon of land from Clinton to Boston will be removed over coming months, after state officials announced Tuesday they would make a network of trails over a century-old system of aqueducts accessible to hikers, bikers, or anyone seeking a stroll in the woods. By Will Doig -- From bike lanes in Brooklyn to desperately needed housing in D.C., public micromanagement has become such a problem that several cities are now trying to rein in the Not-In-My-Backyard crowd. "The current process does not work for anyone," one urban design expert told the San Francisco Chronicle. "We want the Planning Commission to focus on big planning issues, not micro-design issues." By Eric Jaffe -- Silly as it may seem to the public, there's an intense disagreement among scholars about the impact urban trees have on a city's crime rate. Some are convinced urban greenery increases crime -- arguing that low trees and shrubs, in particular, create a natural hiding place for criminals. [...] Others are convinced that urban trees have exactly the opposite effect.